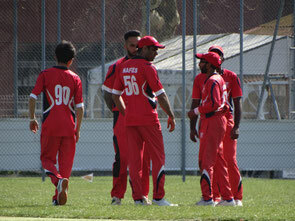 WCC sent out a very strong statement beating a strong Zurich Nomads CC in a high scoring warm-up game in Deutweg, Winterthur on Sunday 31st March 2019. 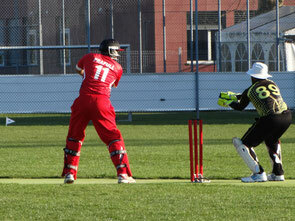 Zurich Nomads Captain Azeem won the toss and elected to bat first. They had a decent opening stand, with there new signing Hassan and Vicky, before Hassan (20) was brilliantly caught by Adam in the gully off Rod. Several other ZNCC batsmen got starts but we're undone by the slow loopy bowling of Bhanuka and the contrasting different WCC' s latest signing Rajveer Tiwana's pace. The other stand out performances for the ZNCC were Vicky (105) who was nicely caught by Prafull off Adam and that of Captain Azeem (46) who was clean bowled succumbing to the Pace of Rajveer. With a steep chase ahead, the WCC captain decided to send in experienced Prafull Shikare to open the batting along with Cheema, together putting up a 66 run stand in 8 overs before Prafull got out caught at deep mid-wicket. Kasun the more solid of the WCC batsmen who went in at number 3, dropped anchor and played around Cheema, allowing Cheema to do what he does best, to stay aggressive. Cheema was out when the total was 102-2 caught at deep extra-cover for a well played 55 runs. Bhanuka who went in at number 4 along with Kasun played a wonderful innings, both complementing each other, rotating strike and hitting the bad balls to the boundary. Bhanuka was ajudged LBW for 32 runs when the total was on 188-3 in the 26th over. In order to take advantage of a mentally and physically drained ZNCC bowling attack WCC captain decided to send in Rajveer who is known for his hard hitting style of batting, he hit 2 massive sixes in consecutive balls and got out in the 3rd ball he faced. With the total on 200-4 in 27 overs. Kasun and Anoop then continued to rotate strike and hitting the odd boundary before Kasun too decided to cut loose and hit four consecutive boundaries and soon reach his half century, but was soon undone and was adjudged LBW for a well made 56 runs. With the total at 236-5 Safi joined Anoop in the middle to play his role as the aggressor to keep the required run rate under control, and he did exactly that and made a well played 32 runs when the total was on 276-6 in 35 Overs. It was then the turn of Captain Mo who decided to join Anoop in the middle and didn't want to do anything silly to give ZNCC any chances of a comeback, so along with Anoop, they decided to get the rest of the runs in singles and seal a well deserved victory for the Winterthur Cricket Club. "It was a tremendous team effort, my players have shown great mental strength chasing 289 for Victory against a bowling attack of ZNCC is not at all an easy task, but this goes on to show how far we have come as a team. Of course our bowling department has more work to do but I know it is only a matter of time before my bowlers also start delivering and our fielding also needs a little bit of work but I am sure we will be able to put everything together by the time the league starts. For now 2 out of 2..... I will take that." 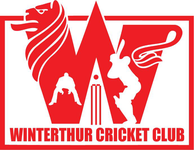 Next warm-up game is on the 7th of April (Sunday) against last year's CSPL runners up Olten Cricket Club (now Swiss United) at Deutweg, Winterthur. "I would like to invite more of the passive and honourary members to come and watch the team play, your support will be very much appreciated and encourage the players to push that little bit extra. - Captain Mo"